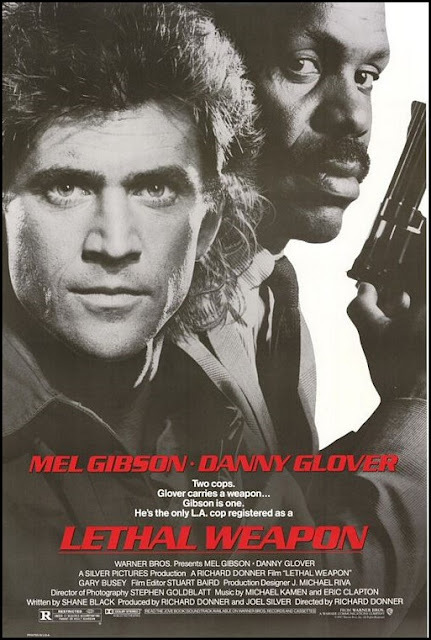 Chrichton's World: Review Lethal Weapon (1987): A buddy cop film classic! Review Lethal Weapon (1987): A buddy cop film classic! Lethal Weapon is a Christmas themed action flick. To be precise a buddy cop film classic. I watched it today for what must have been the tenth time or so and found myself enjoying it yet again. So what makes this film a classic? The buddy cop element is strong in this one. It's a whole lot more important than the murder mystery that has to be solved. Martin Riggs (Mel Gibson) is very unstable and suicidal. But on top of that he is a cop and you can imagine how that could lead to very volatile situations. Riggs gets paired up with veteran cop Roger Murtaugh (Danny Glover) who just turned 50 and wants to take it easy until his pension. That of course will be impossible with loose canon Riggs as his partner. However against expectations the pair seem to be very effective together and soon learn to rely and depend on each other against the sneaky and evil villains like Joshua (Gary Busey) amd The General (Mitchell Ryan). The newly formed duo have to go above and beyond their duty to deal with these thugs although they are quite able to do so. Especially Riggs since before he became a cop was in the special forces and as he states himself was very good in killing people. He is so to speak a lethal weapon. Hence the title. What I really like about the film that despite the comedic moments it's a serious and gritty film. While the violence isn't explicit or gory you are not spared. The villains aren't joking around and have no problems hurting or torturing people. In one scene they are even prepared to sexually assault Murtaugh's daughter. It really helps you dislike these villains and makes you root for the characters no matter if at one point they become too bloodthirsty. If by now you haven't seen this then please go watch it. Especially during the holidays.